Did you submit for your Pre-Order Bonus (256 GB SD / Gear Fit 2 / Netflix)? Post Here! Did you submit yet? I just did for the 256 GB card over at https://promos.samsungpromotions.com/galaxyoffer. I am on T-Mobile. If you did ... list the below! What did you go for? (Gear Fit 2, SD Card, Netflix (T-Mobile Users)? *Edit* You can check your status and things through Samsung Pay. Thanks tourbound129! 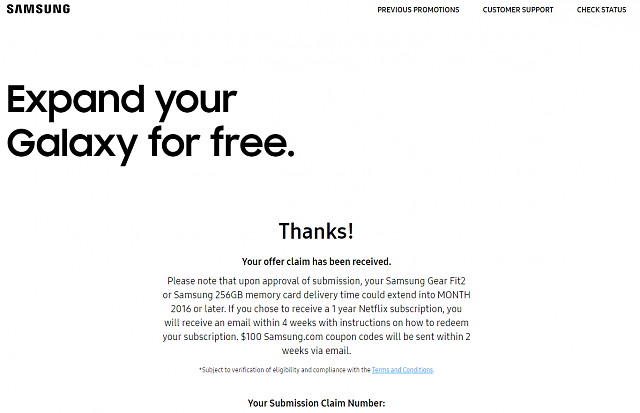 What is Samsung asking for as proof of purchase when you redeem for your free gift? olliedawn and Patrice Maycock like this. IMEI / WiFi MAC Address. Please make sure your receipt clearly shows the Qualifying Purchase or lease, date of purchase or lease, and your full name. Note: Receipt must include a printed date of purchase or lease within the Purchase Period and the name on your receipt must match the name on the Offer Claim Form. I'm on TMo and I don't know what to get. I already have Netflix free for another year, a Gear S2 Classic, and a few 64gb and 128gb cards. Any suggestions? If I ever get my Note 7, I'll be on it right away. Hopefully by this time tomorrow. I would either get more Netflix so you have it longer for free or the Fit 2 if you like watches. I would take the 256GB card. I submitted at 330pm today and it's still under review! Hopefully it goes well but I don't want to worry about it like I did with Note 7 shipping times this week. Mine's been approved for the 256GB micro sd. Edit: Forgot to mention. I'm on T-Mobile. Mine is under review still. We will see how long it takes. Maybe you can add to the OP that you can submit in the Samsung Pay app as well. I didn't but it's there. You can pretty easily check your status in the app as well. Almeuit and cinnamin like this. Mine was just approved and says preparing for shipment. how long do these take to ship? Will it say how it will be shipped and tracking number so I can track the UPS flights lol? Lol yeah you'll get a tracking number at some point. I believe they gave themselves 12 weeks to fulfill. We'll see. Gear Fit 2 and Still Under Review, but just submitted it in the last hour or so. Submitted and approved. 256Gb card here. I am a little confused about the value of the 256gb card based on amazon pricing for similar items. What is special about this 256gb card? What can I not do with the 128gb card which is selling for $40? Jeez. It will be thanksgiving before I get it then! Quadrooter fix for AT&T Branded Priv? Why did all my contacts disappear?